A friend and I met at the Heald and Bradley Ponds Reserve in Lovell this morning. I only just noticed that this sign places Bradley Pond first–I’ve always heard it the other way. Funny how your mind reads what it thinks is there. At least mine does. Makes the job of editing a slow process–for good reason. I love that the sign shows three peaks, as there are three peaks here–Whiting Hill, Flat Hill and Amos Mountain. Our mission today, however, was to check out the saw mill site off Slab City Road and walk to Otter Rocks. We completed said mission and chuckled that it took us less than three hours to walk the short distance out and back. But the gifts we received along the way were many. To begin with, it was an absolutely gorgeous spring morning. 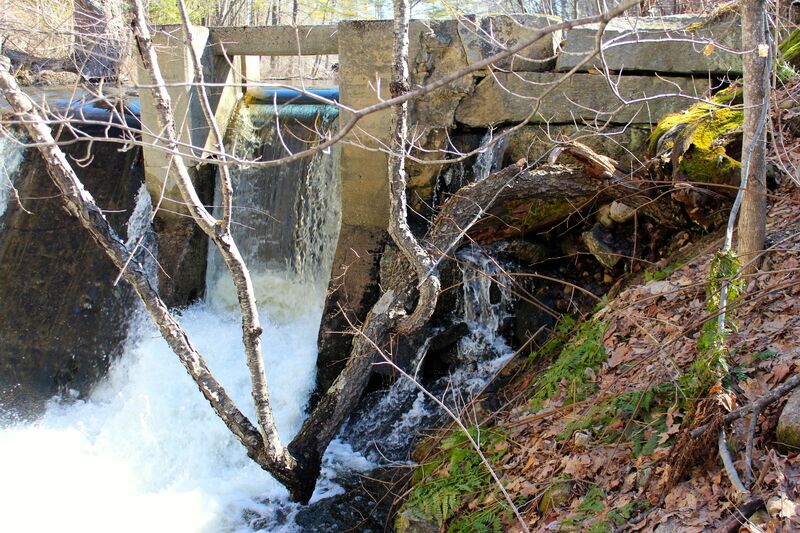 Water raced over the dam at the mill site. 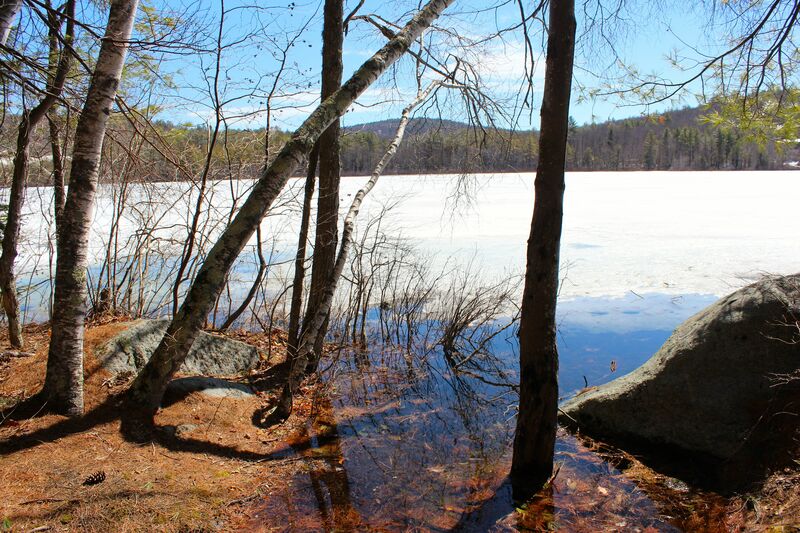 Timber long played an important role in Lovell, as in other towns throughout New England. 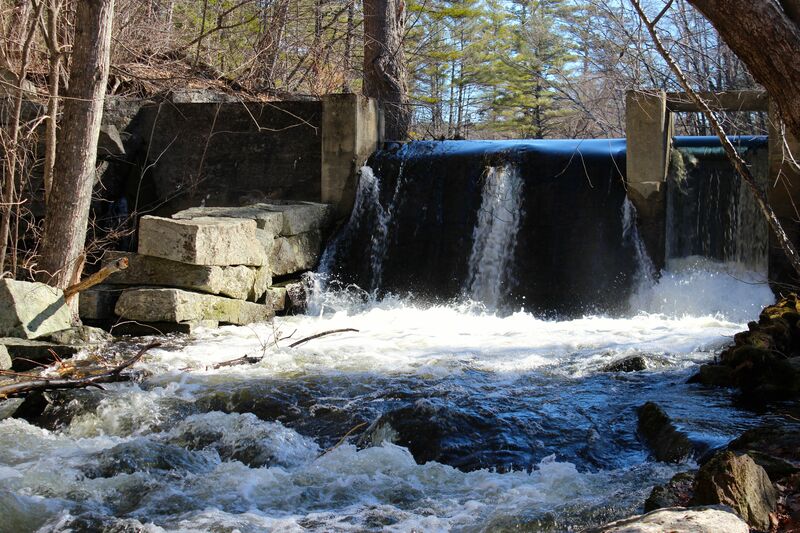 And water provided the power at the saw and grist mills before steam engines were put to use. This mill site features a combination of quarried stone and cement. On the Lovell Historical Society’s Web site, there are several photos of mills in the Slab City area. 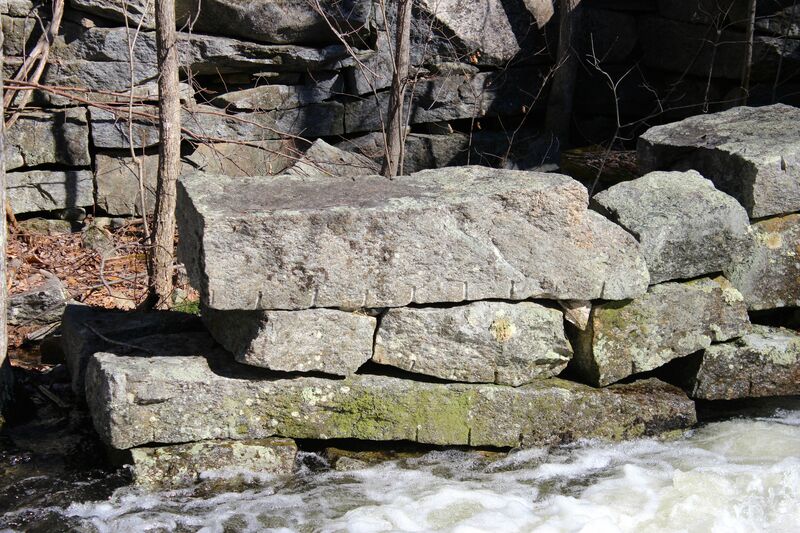 I wonder about the efforts to quarry the stone, move it to the brook, and build the dam. I also wonder about other things–like this cherry tree that grows out of the sloped land, dips down toward the water and then reaches skyward. Enviable perseverance. 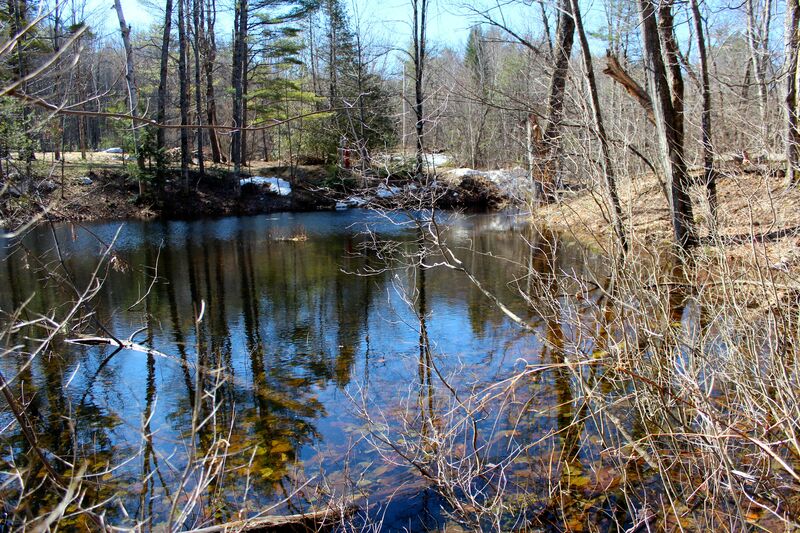 Here’s a look at the mill pond above the dam. 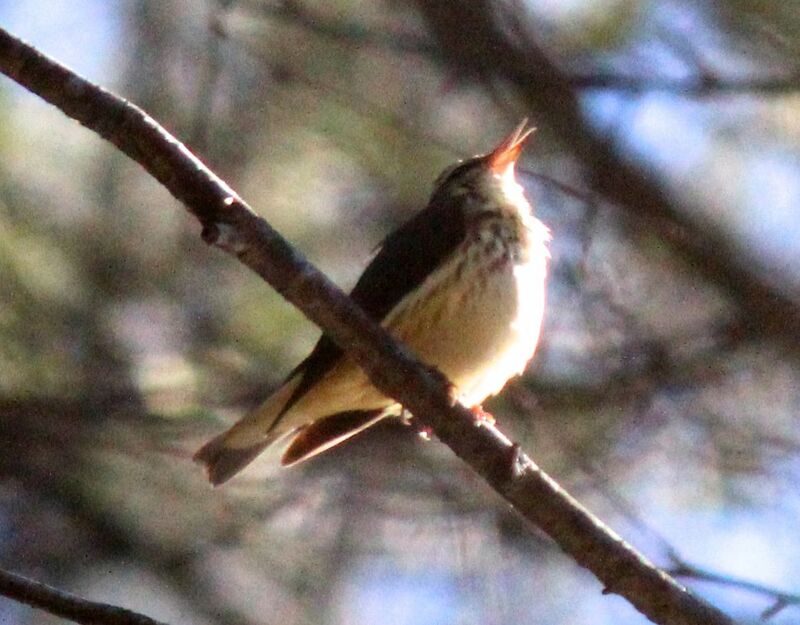 And then there was the gift of song as this warbler sang to us from a branch above. 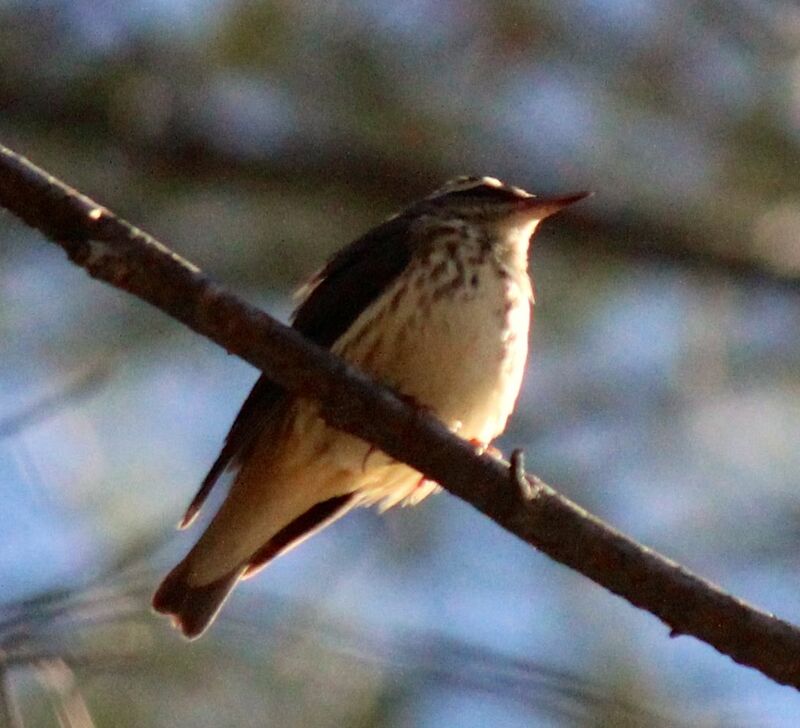 Or is it a Louisiana Waterthrush? And an evergreen fern, matted from a long winter’s rest. 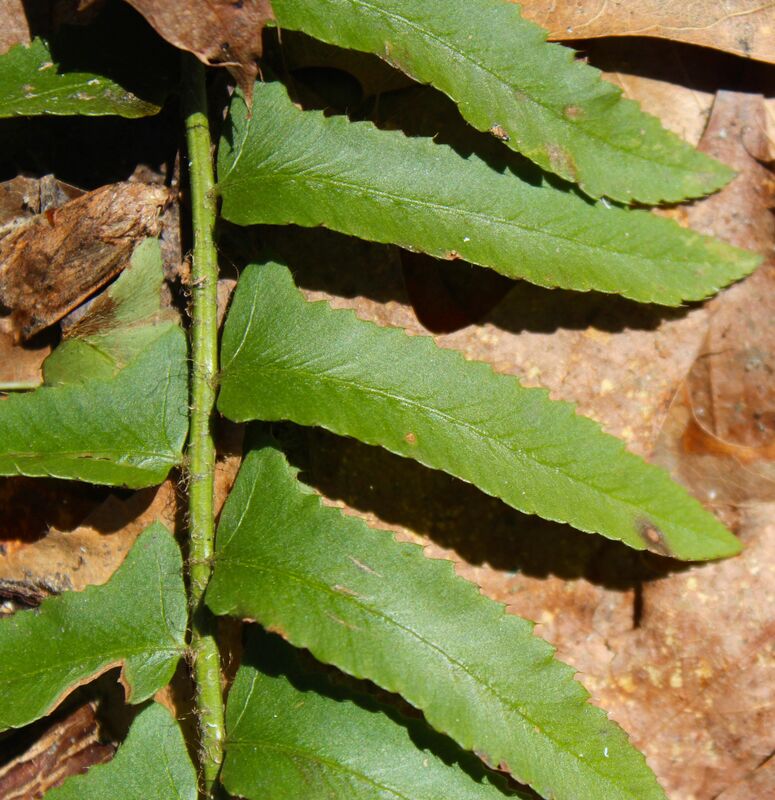 Plus grape fern and its old fertile frond, for which it derives its name because the sporangia have a grape-like appearance when they are fresh. 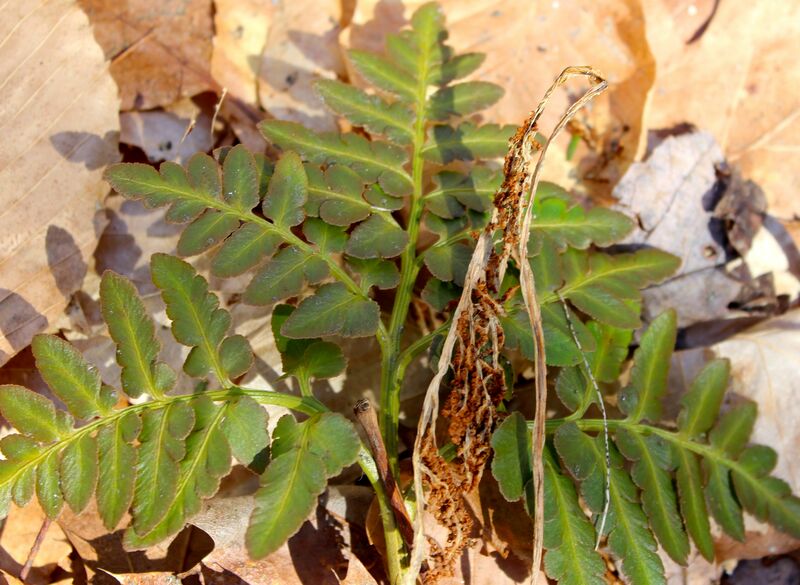 The third fern gift of the day–Christmas fern, so named because each leaflet looks like a Christmas stocking or Santa in a sleigh behind his reindeer. I didn’t notice any fern fiddleheads, but the snow only melted this past week. There’s still so much to look forward to. I’ve been watching beech tree buds for at least a month. What I noticed today is that most buds are still wrapped up in scales and retain their cigar shape. On saplings, however, it’s a different story. Along the path, several were unfurling. Perhaps because of their smaller size, they want to be first to leaf out, thus taking advantage of any available sunlight before the larger trees form a canopy above them. Just a thought. I’ve not had the privilege of seeing otters here, but plenty of other things revealed themselves today. 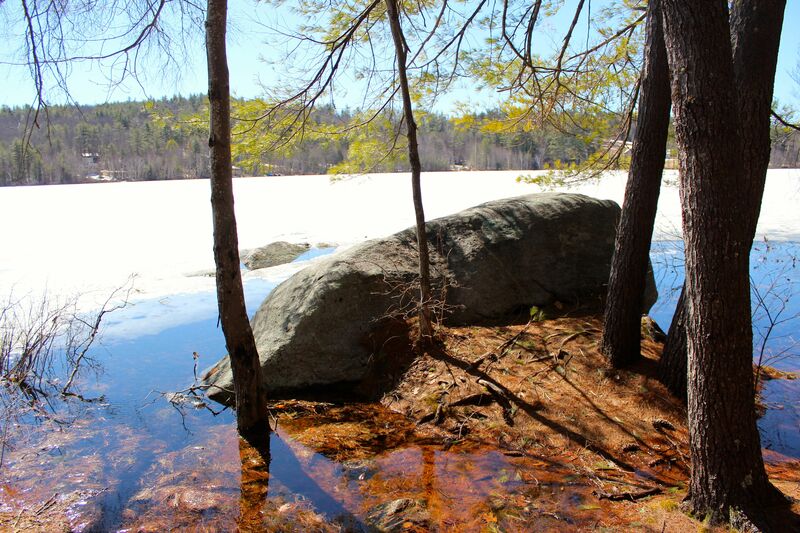 The melting ice fooled us only momentarily. 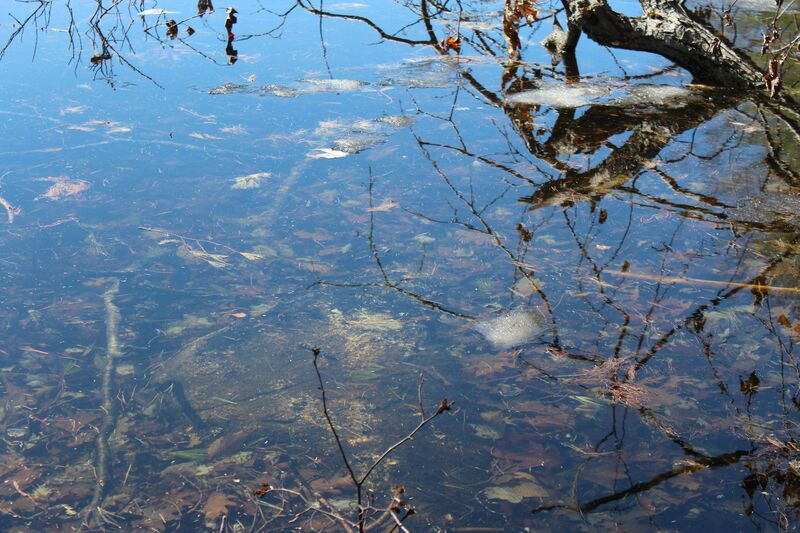 On first glance, it looked like egg masses, but proved to be small masses of ice floating on the surface. 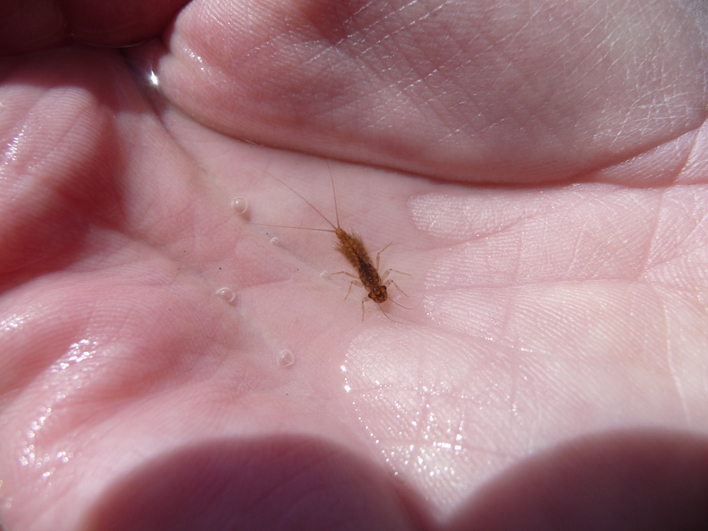 Though you can’t see it here, we watched a kazillion aquatic macro invertebrates swim about. 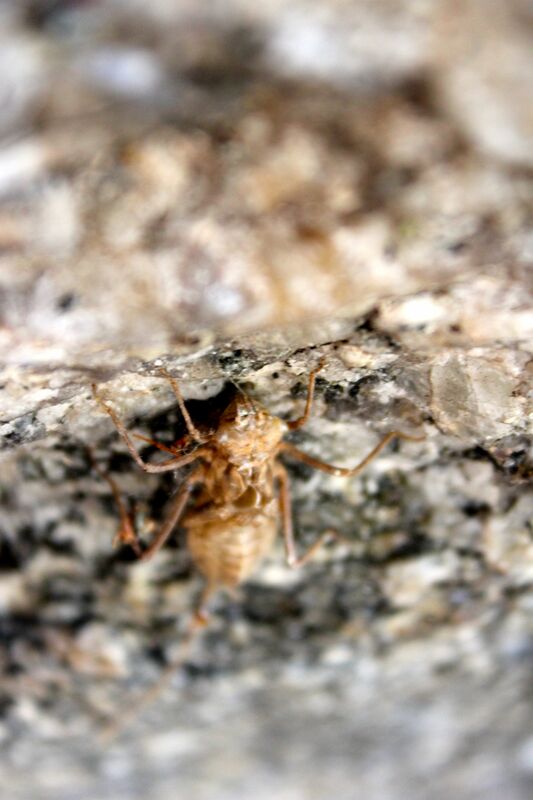 On otter rock itself, there are exoskeletons from hatchings that occurred in previous years. It was difficult to pull ourselves away and we have plans to return with sketch books and food and cameras and maybe even some wine–to spend some time taking in all that this lovely spot has to offer. 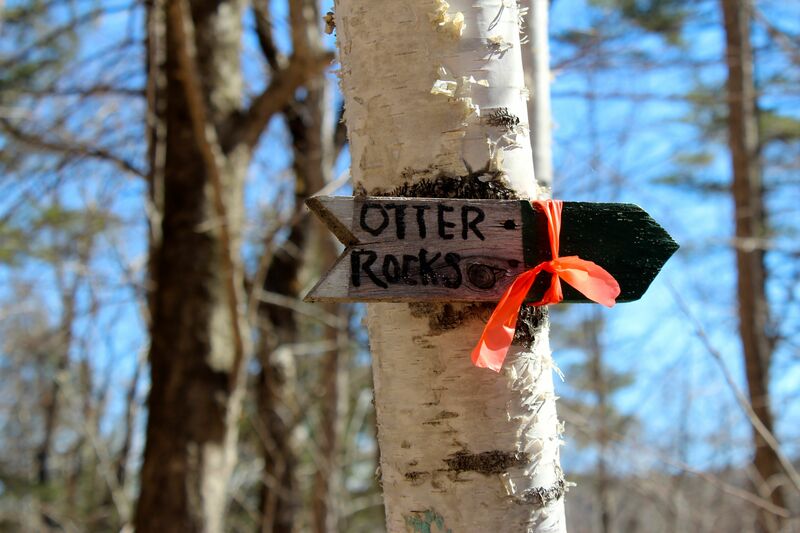 For today, we needed to wend our way back up the trail. There were still a few more moments of wonder to be had. 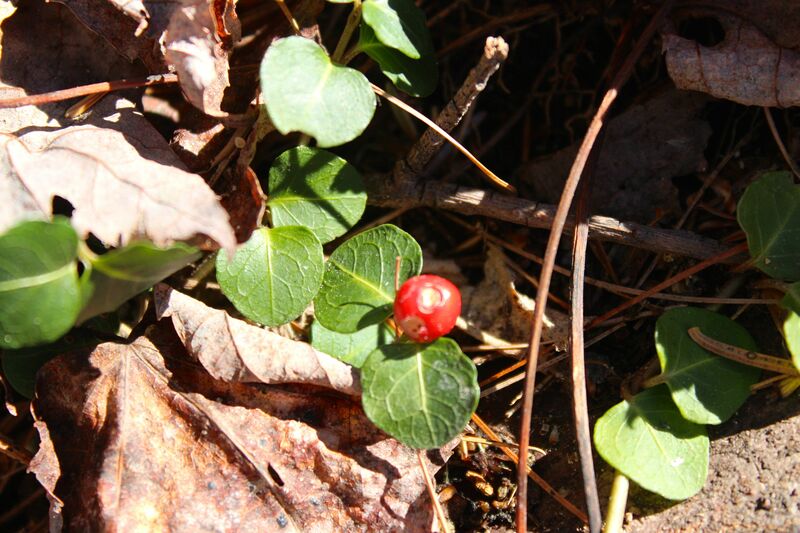 Take, for instance, the partridge berry with its opposite evergreen leaves and berries with two spots on the surface, a result of the fusion of two ovaries. This plant produces two white flowers, one with short pistils and long stamens and the second just the opposite. In order for a berry to form, both flowers have to be pollinated. Nature has it all figured out. Why don’t I? 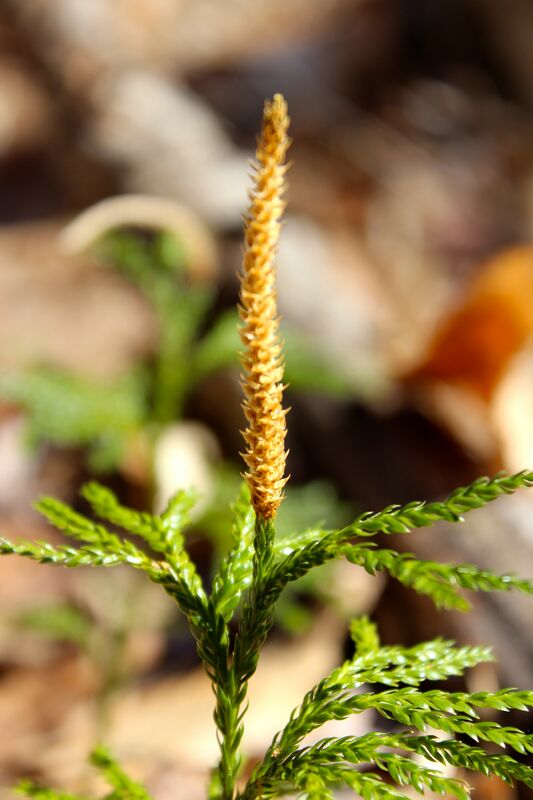 A princess pine club moss shows off its upright spore-producing candelabra or strobili. 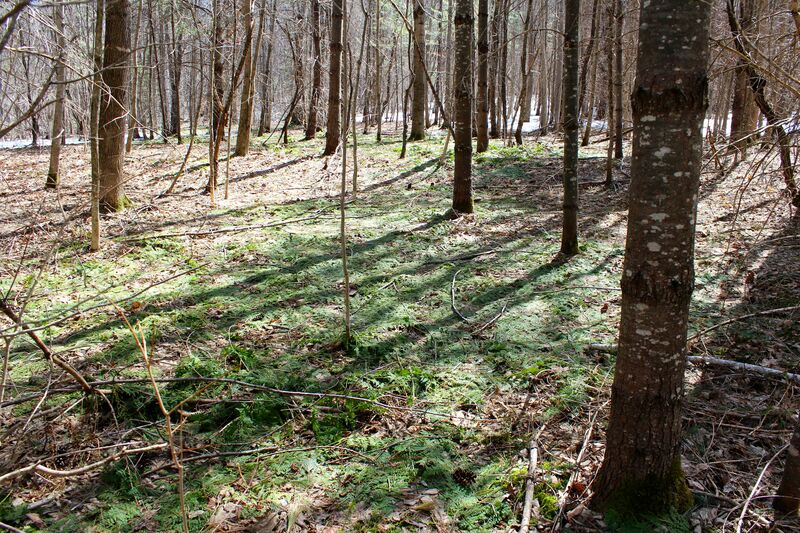 Funny thing about club mosses–they aren’t mosses. I guess they were considered moss-like when named. Just as the mills take us back in time, so do these–only much further back when their ancestors grew to 100 feet tall during the Devonian Period. They make me feel so small and insignificant. And yet, I’m thankful for the opportunity to be in awe of them. 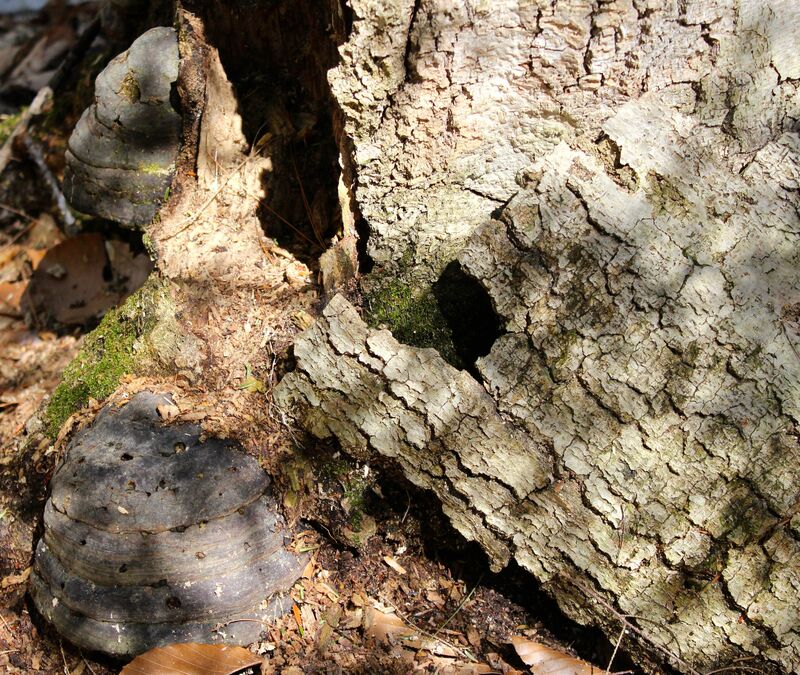 Again the insignificance makes itself known–as this tree dies, it provides life–for carpenter ants, pileated woodpeckers, mosses, lichens and tinder polypore or hoof fungus. And probably so many more species. On a nearby tree, the fruiting bodies of the tinder conks grow at the base, giving them a true hoof-like appearance. Giddy-up. 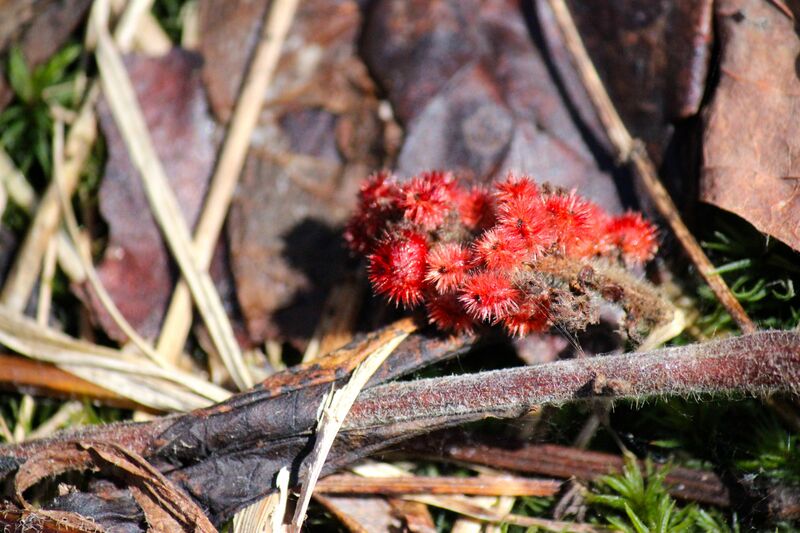 We were almost back to my truck when we saw a clump of staghorn sumac shrubs. 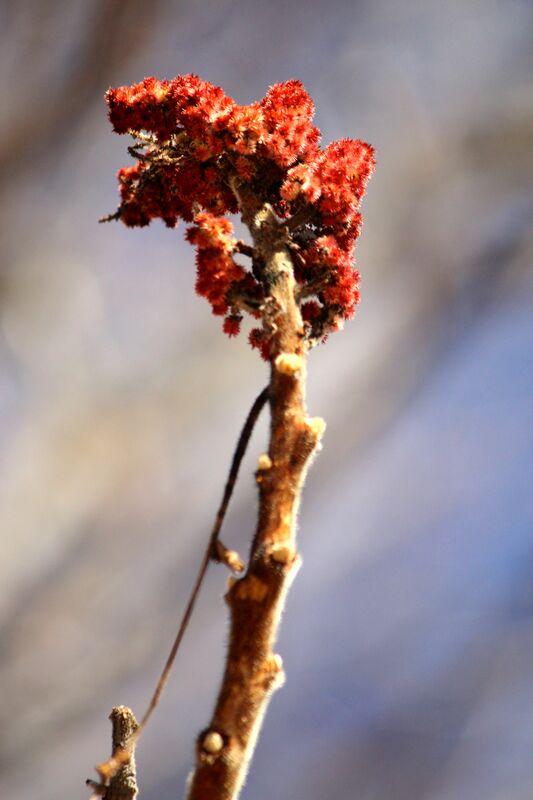 I grew up in the land of poison sumac, so it’s taken me a while to warm up to this species. But the hairy red fruits are a work of art in their own right. Plus, they provide food to wild turkeys, ruffed grouse and others. Some people make tea from the summer berries. I, um, can’t bring myself to try it. Check out the hairy antler-like growth pattern. So maybe I won’t seep the fruits for tea, but I can certainly enjoy the other features staghorn sumac offers up. And though not all of my posts include tree bark, I like it when they do. 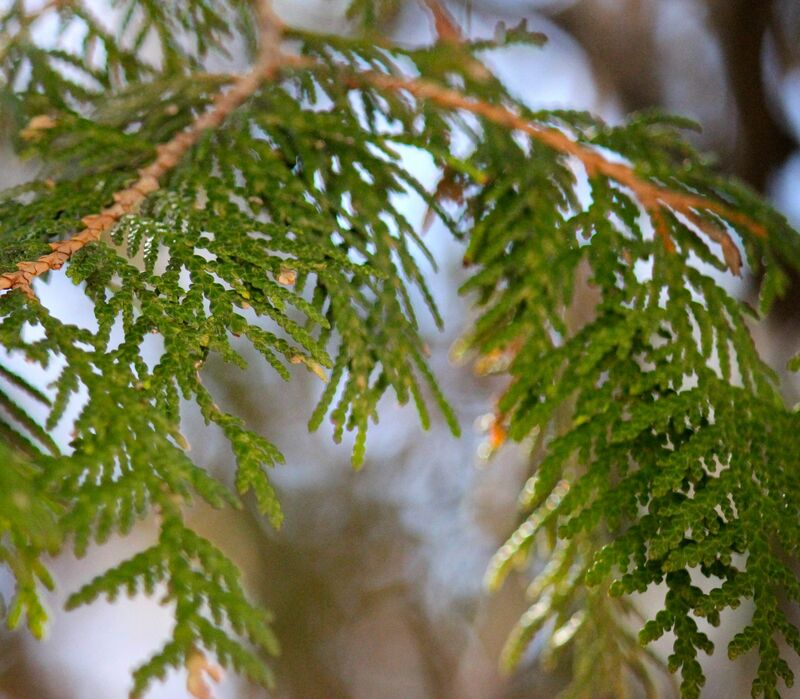 In this case, Northern White Cedar (Thuja occidentals). 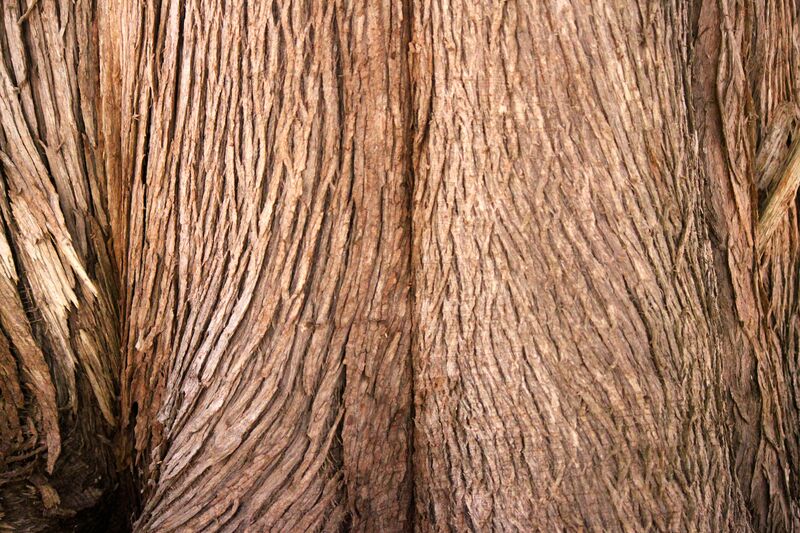 The lines of the bark follow the shape of the tree. And its leaves are flat and scaly–reminiscent of princess pine. My friend, Jinny, and her husband Will, are forever naturalists. He wasn’t with us today, and doesn’t often trek with us, but I suspect that he was channeling our adventure. They own many acres and know their land intimately. Sometimes they invite me along to walk their trails and wonder with them. Together, we learn. And they get me. I know this because every so often they give me gifts from their land. Today, I was the recipient of two gifts. Trail blaze on a downed tree? No, Green Stain (Chlorociboria aeruginascens). In his book, Fascinating Fungi of New England, Lawrence Millman writes, “The stain was once used for Tunbridge ware–decorative wooden objects inlaid with strips of colored veneer.” I’d much rather have this piece of wood. 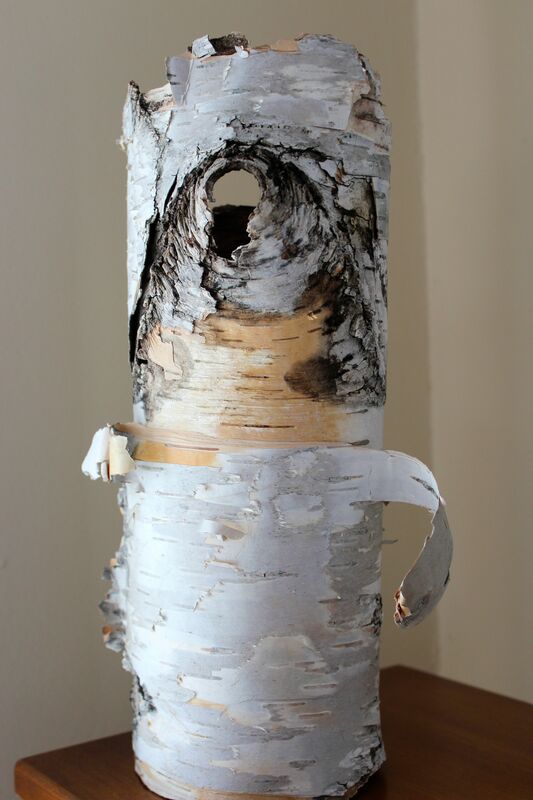 The other present is an intact piece of paper birch bark–peeling, chalky white outer bark, orangey inner bark, a hole where the branch was and a fu manchu over the branch hole. Perfection. It will certainly be a useful teaching tool, but in the meantime, it’s earned a spot on top of the bookcase in the summer kitchen. One last gift from the land. 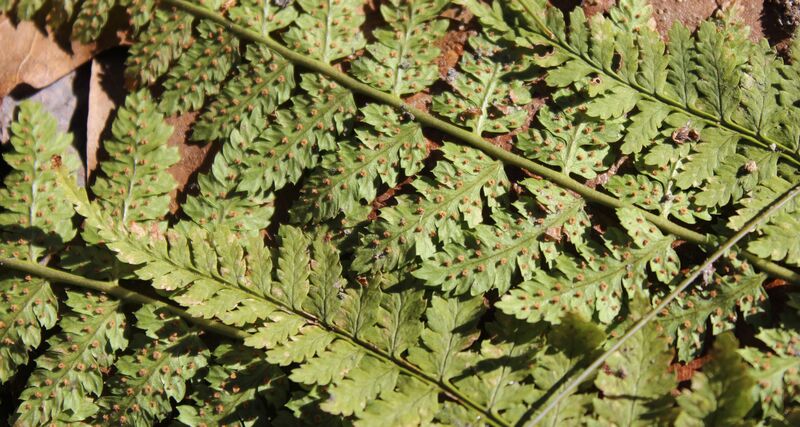 These evergreen ferns, matted from a winter under snow, invoke a touch of spring fever. It was a short wander with a lot of wonder. Thanks for joining me. Leigh, this is always such a treat! We were in Lovell yesterday, and visited friends on the Slab City road. I, too, marveled at the water roaring over the Heald Pond dam! But you really should take a drive up to Auburn/Lewiston to see the mighty Androscoggin roiling above the Canal Bridge!! Truly awesome. Ann, I can’t believe you were right there yesterday. Sorry to have missed you. As we were leaving a couple of hours after beginning our trek, we noticed how much more water was flowing. Ah, yes, the mighty Androscoggin! Great stuff! You probably already know this, but I thought it might be useful. Barrels to hold liquid were always made from white oak (none of which grows at Heald-Bradley), and red oak was used for dry goods (like corn or flour). The exception was molasses which is thick enough not to leak through the porous red oak that was harvested here. It took me years to find this out! The “tinder conks” were actually used by native people to carry fire from one campsite to another. 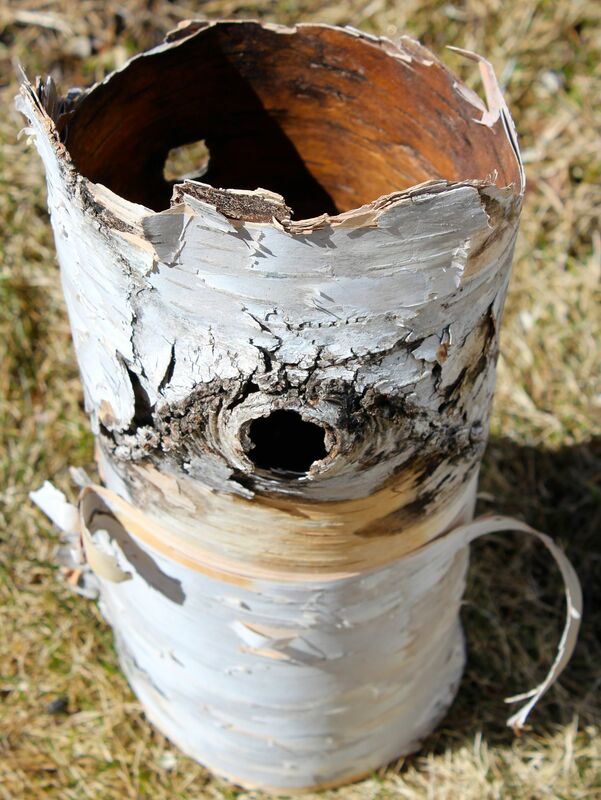 When you light a dry conk it will burn slowly (producing a bad smell), that will last for many hours and can be blown into a flame with the right tinder to help it along (like birch bark).